An American fleet of nine ships under the command of Captain Oliver Hazard Perry routed a British fleet in the Battle of Lake Erie on September 10, 1813. 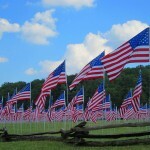 After the battle, Perry sent a famous dispatch to U.S. General William Henry Harrison that read, “We have met the enemy, and they are ours.” The Battle of Lake Erie forced the British to abandon Detroit, ensuring U.S. control over Lake Erie and the territorial northwest. 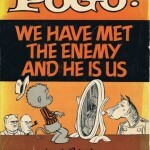 Years later, Pogo, Georgia’s Official State Possum, would paraphrase Perry’s dispatch. 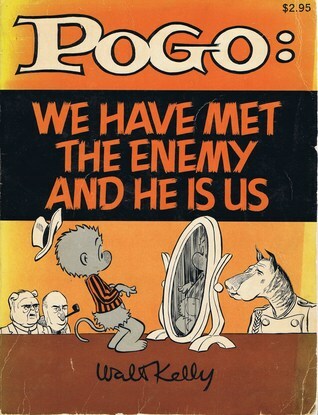 And eventually, Pogo’s statement that, “We have met the enemy and he is us” would become the official slogan of the Georgia Republican Party. On September 10, 1991, Senate confirmation hearings began for Georgia-born Clarence Thomas, who was appointed by President George H.W. Bush (41) to the United States Supreme Court. Nirvana’s Smells Like Teen Spirit was released as a single on September 10, 1991. On September 10, 2002, the Atlanta Braves clinched an eleventh straight division title without playing, as a loss by the Philadelphia Phillies assured the Braves the title. Government Irony of the Week: A fountain in Columbus has run dry, while the Columbus Government Center suffers periodic flooding due to plumbing problems, according to the Ledger-Enquirer. One of the city’s largest fountains in front of the tower on 10th Street has been shut down until plumbers can install some new parts, said Pat Biegler, director of Public Works. With crumbling pipes and other systems failing, the fountain parts are in line with needs city officials have faced with three flooding events since June 18 that left the 10th and 11th floors closed indefinitely. A recent review of damage indicated that it would cost almost $6 million to repair drain lines, fire sprinklers and other systems just to buy time until a decision is made on the entire structure. She is hoping a crew will get to the fountain in the next two weeks or later. “We’re hoping if things stay quiet to get the fountain repaired in the next couple of weeks,” Biegler said. 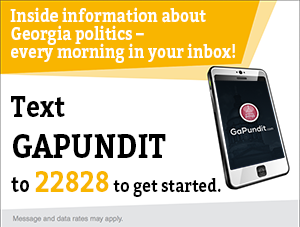 An Atlanta Journal-Constitution poll shows the Governor’s race deadlocked at 45 percent for Republican Brian Kemp and 45 percent for Democrat Stacey Abrams. About 63 percent of voters approve of Deal’s performance, while only 1 in 5 disapprove. The high marks came from across the political spectrum, with nearly half of Democrats and 64 percent of independents giving the governor favorable reviews. Pew Charitable Trusts looks at state government programs promoting nutrition as a healthcare issue. Steve Foster, the Democratic nominee for Congress in the 14th District, will campaign from a jail cell, according to Newsweek. “Look, I’m not withdrawing,” Foster said. Savannah is considering a ban or regulation on internet-enabled electric scooters, according to the Savannah Morning News. While the scooters present a unique transportation option for individuals, they also present a host of challenges for local communities, City Manager Rob Hernandez told the Savannah City Council during a workshop concerning the issue last week. Often deployed in cities without warning, the “shared mobility devices” may soon be prohibited from operating in Savannah before their potential arrival. An ordinance going before the Savannah City Council next week would not block the use of privately owned scooters, but would prohibit the operation of personal transportation vehicles that are accessed by an on-demand portal, such as a smartphone, and made available to the public in unstaffed, self-service locations. If the council chooses to adopt the ban, the ordinance can always be amended to allow for the regulated use of the vehicles, said Sustainability Director Nick Deffley. Georgia College wants to train more psychiatric nurses to address a shortage in the state, according to the Macon Telegraph. The Psychiatric Mental Health Advanced Practice Registered Nurse (PMH-APRN) program, launched in the summer of 2016, teaches nurses how to cater specifically to the needs of patients with mental disorders through six semesters of full-time or nine semesters of part-time study. Researchers expect the U.S. to face a shortage of 193,000 nurses by 2020, according to a 2015 Georgetown University study. Of the 50 states and the District of Columbia, Georgia had the second-lowest concentration of nursing professionals per 1,000 residents, the report found. The shortage is especially pronounced among psychiatric nurses, Baker said. Nearly every county in the state faces a dearth of mental health care providers, and in Georgia, 205 more mental health care professionals would need to start practicing in the state to adequately meet the needs of its more than 10 million residents, the Kaiser Family Foundation reports. 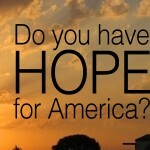 The shortage impacts each tier of the medical field, from psychiatrists to school psychologists to nurse practitioners. A shortage of psychiatric mental health nurses means not only that there aren’t enough nurse practitioners to provide care for those in need, but there also aren’t enough professors qualified to train more nursing students to enter the field. Godwin said there was a big push for more psychiatric nurses in the 1960s and 1970s, but many of those practitioners have since retired, leaving a void in the sector. [Professor and program co-director Carol Dean] Baker said Georgia College is committed to training more nurses like Godwin to earn their psychiatric nurse practitioner’s certification and use it to fill the gap in mental health care that has plagued the state for years. All of the nurses who have graduated from the program or are pursuing their certification now worked in the state beforehand, and Baker thinks they’ll stay. Gwinnett County is on a train headed to a March 2019 transit referendum, according to the Gwinnett Daily Post. Gwinnett County Commission Chairwoman Charlotte Nash, who has already said she believes the referendum will pass, expects to spend a lot of time leading up to the referendum explaining the contract to the community. Just don’t expect an all out education campaign from her immediately. After all, there is a general election with several contests including the heated and closely watched governor’s race coming up in November. Grovetown’s newest employees are making a splash on social media, according to the Augusta Chronicle. Visitors commenting on the Grovetown Neighborhood Watch Facebook page have asked about the goats – such as their location and their well-being. In late July, the city started a Facebook page just for the goats, to tell people about the herd’s comings and goings. The page has more than 140 followers. Grovetown is one of a growing number of cities that use goats to clear vegetation on municipal property. Savannah, Ga., has been giving a herd of goats a test run this summer. Norcross, near Atlanta, started using the animals as part of a park development this past spring. Grovetown bought its first five goats about two years ago – from a farmer in Washington, Ga., and from a person in Harlem – for about $50 each. Since then, a couple goats have died of natural causes but more have been born. Now there are 15 in the herd, which Waller calls “manageable,” and there are no plans to expand. Keeping the goats costs about $1,000 a year, mostly for worming medicine and for supplemental food during the colder months, Waller said. The Valdosta Board of Education is seeking candidates for a vacancy in the District 2 seat, according to the Valdosta Daily Times. The Savannah Harbor-Interstate 16 Corridor Joint Development Authority has applied for a permit from the U.S. Army Corps of Engineers to build a prospective manufacturing facility on protected wetlands, according to the Savannah Morning News. The Gainesville City School District is considering how to recruit more minority teachers, according to the Gainesville Times. The Board of Education allocated $100,000 this year to implement this minority recruitment plan for up to 10 future employees — part of a broader hiring measure that included additional funding to fill positions in work-based learning programs; positions to support nurse caseloads at Gainesville middle and high schools; and new special education professionals. Gainesville City Schools Superintendent Jeremy Williams said staff turnover and changing demographics prompted the board to pursue the hiring plan to attract and retain teachers from minority backgrounds. That includes pursuing fluent Spanish-speakers like Esqueda, who was born in the United States to Mexican immigrants. Hispanic students are a majority of the district’s student body at 60 percent, but 80 percent of the system’s teachers are Caucasian, according to Williams. Just 15 percent of the student population is white, while African-Americans account for 19 percent. Larry Morten, a former bookkeeper in the Glynn County Superior Court Clerk’s Office, pleaded guilty to 70 counts of theft covering more than $76,000, according to The Brunswick News. Henry County Commissioners increased the administrative fee for occupational licenses, according to the Henry Herald. Henry Commissioners also passed a resolution supporting the new transit agency, the Atlanta Transit Link, according to the Henry Herald. Rome City Commissioners will hear a report on housing supply, according to the Rome News-Tribune. The Glynn County Board of Education will meet Tuesday and consider changes to procedures for discipline hearings, according to The Brunswick News.